by Urmila Lanba, Vision Books, Pages 160, Rs 325. 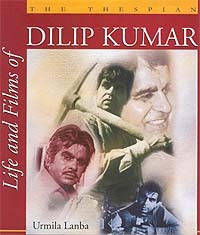 DILIP Kumar has often been asked to write his autobiography. The gentleman that he is, he has always refused on the grounds that he would be hurting too many people (read heroines). But the present book on the thespian gives an insight into the life and works of Hindi cinema’s greatest actor. Those of us who have grown up on Dilip Kumar’s films and lived through his peak years will feel completely updated about the events in his life. There is hardly any area of Dilip Kumar’s life which has not been explored. So we have chapters on his early life, family, entry into films, his heroines, acting skills, marriage, the Asma episode and his flirting with politics. How can one overlook the priceless pictures from his movies, personal photographs and the sketch M.F. Husain made of the actor specially for the writer? The writer, Urmila Lanba, has certainly taken pains and spent several years in bringing out the details by talking to his family members and those who have worked with him or have been associated with him in some form or another. Even his interviews of the past and the present and what the media has had to say about him — all have been artfully incorporated. She has meticulously mentioned her sources. However, one can’t get rid of the feeling that the man himself continues being elusive and remains an enigma. The first section of the book, which deals with Yusuf Khan’s (Dilip Kumar’s real name) days in Peshawar, is indeed the most fascinating. Being an exceptionally good-looking child — very fair, with rosy cheeks and dark hair — his grandmother used to mark Yusuf’s face with a black kohl and shave off his hair. The periodic shaving of his head to ward off the evil eye was perhaps responsible for his thick, dark, lustrous thatch that he later wore in an attractive cut. But that experience of a shaven head and kohl-marked face may also have contributed to Yusuf’s introvert and exceedingly intense personality. Then, as a five-year-old child, he had the horror of accidentally being locked up in a room where the dead bodies of two young Shia boys lay. Years later he would draw emotions from these personal experiences, for instance, the anguish of his shaven head, or the frightening experience of having to spend hours with the deads bodies. Yusuf, born on December 11, 1922, belonged to a family of six boys and six girls. He has always been emotionally attached to his family which he admits has kept him going. The writer has found out the details of the entire clan — who is married to whom and settled where. It’s interesting to note that several well-known film personalities like K. Asif, Begum Para and later Mazhar Khan were related to Yusuf’s family. Yusuf Khan became Dilip Kumar in 1944 when he joined films and, perhaps, the legendary Devika Rani was responsible in giving him this name. His first release was Bombay Talkies’ Jwar Bhata, which left the critics unimpressed and did moderate business. It was only his third film Milan, in 1946, that brought Dilip Kumar his first box-office success and personal recognition. Thus began a long successful career spanning more than 50 years. The author has chronologised all his films, right uptil his last release Qila in 1998. We learn that Dilip Kumar, a well-read man, was fascinated by the character of Heathcliff from Emily Bronte’s Wuthering Heights. He did three films, Arzoo, Sangdil and Dil Diya Dard Liya, based on the brooding persona of Heathcliff. Dilip Kumar put in his all in the film Devdas made under Bimal Roy’s impeccable direction. The author narrates that there was an instance when the shooting for the day was over and everyone except Dilip Kumar had gone home. Dilip was planning to spend the night at the studio because the next day’s shot required an unshaven, sleepless look. That was Dilip spending a sleepless night in order to lend authencity to the next morning scene! He won the Filmfare award for his brilliant performance in this film. The public too loved him as Devdas and critics gave him excellent reviews. But Dilip had to seek his psychoanalyst’s advice after doing the consuming role. So when Azaad came it freed him from the shackles of being a tragic hero in film after film. And he went on to do Kohinoor, Leader and Ram aur Shyam; showing a flair for comedy as well. Another interesting chapter in the book is on Dilip Kumar’s relationships with his heroines. But this portion only includes the views and comments of other film personalities. So we have film critic Rinki Bhattacharya, daughter of late Bimal Roy, note that in his younger days Dilip’s "name was linked with most of his heroines." Dilip underplayed his emotions, projecting both a certain helplessness and an inherent goodness of character, a deadly combination which never failed to appeal to women cinegoers. Kamini Kaushal was probably the first woman Dilip fell in love with. Writer Ismat Chugtai once revealed that during the shooting of Arzoo, Kamini and Dilip would hold hands on the sets but would cover their hands with the film script! But Kamini was already married and divorces were rare. Family pressures on both sides were great and Kamini’s brother, who was in the Army, threatened Dilip. Under the circumstances, it was not surprising that their relationship should have ended. Then came the beautiful, lively, giggly Madhubala with here million-dollar smile. She was just the person Dilip needed. But Madhu was dating Dilip on the one hand even while keeping actor Premnath on hold! She had been in love with Premnath prior to meeting Dilip. However, it was Madhu’s father who was ultimately responsible for the Madhubala-Dilip Kumar breakup. Dilip Kumar, a highly eligible bachelor and heart-throb of millions, got married at the age of 45 to filmstar Saira Banu, who had arrived on the scene with her 1961 release Junglee. The marriage that took place in October 1966 has been described in great detail, but more interesting are the events that led to the momentous moment in the lives of the two stars. Thus, we are told of another strong contender Rajendra Kumar’s role in Saira’s life which only hastened her wedding to stalwart Dilip. Saira’s mother Naseem Banu also had a role to play. She persuaded Dilip to marry her dauther as "Islam khatre mein hai." After the marriage Saira never let her in-laws forget how young she was, and would address Dilip Kumar’s friends and colleagues as uncles! None of the Dilip Kumar fans can forget the Asma episode (1980-83) in his life which not only caused a major upheavel in Saira’s life but also tarnished his image to a great extent. A chapter has been devoted to Dilip Kumar’s second marriage which became very messy. To his utter dismay he learnt that Asma had been in touch with her ex-husband all along and the two in fact were leaking out the news to the press. The experience left Dilip a very sad and disillusioned man. Dilip still does not wish to talk about it. All he is willing to say it that it was a mistake. Indeed, the author, Urmila Lanba, a lawyer by profession, has done a lot of research and spent years in order to produce this goldmine on Dilip Kumar. A diehard Dilip Kumar fan has to thank her for such an exhaustive analysis of one of the greatest actors and most charming men the Indian film industry has every produced.